End offshore detention now. 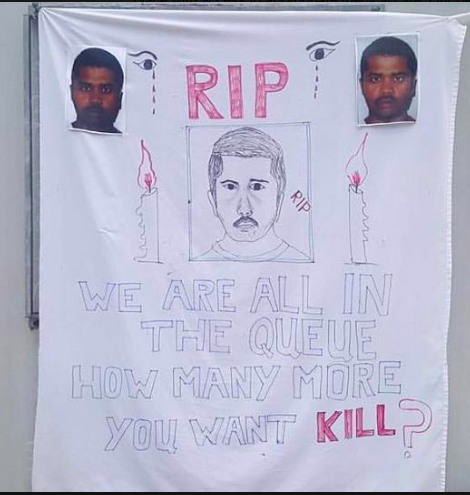 Manus and Nauru crisis. This letter is on behalf of the 374th man on Manus Island, Hamed Shamshiripour aged 31, a refugee who fled persecution in Iran and asked Australia to help him find safety and freedom. He was locked up by Australia on Manus Island for four years. He has been found hanged, dead. Refugees on Manus Island and Nauru are our responsibility. Are you waiting for them to die, one by one? Bring all men, women and children to safety and freedom now. How far will you go, Prime Minister? How many more people will you allow to be killed? He was only 24 years old when we killed him. DIBP and IHMS are now bickering about who is to blame for his death. Australia is to blame. We are mistreating, torturing and killing the refugees on Nauru and Manus Island. Six have died already. Some are close to death right now. The moronic equation, that the thousands of arbitrarily imprisoned refugees must stay on Manus and Nauru for ever as a kind of nightmare fairytale spell against more desperate refugees trying to reach Australia by boat is as unintelligent as it is brutal. A well-connected, richly-resourced and highly educated country like Australia has plenty of resources to find a humane and effective solution to the trickle of refugees who attempt to reach Australia. Mr Turnbull, your entire career has been built on intelligent risk-taking. Why are you defending this unimaginative, wasteful, shoddy regime of offshore detention? Use your brains, and those of some of the best minds in Australia who have already devoted much energy to finding solutions, and get on with it.